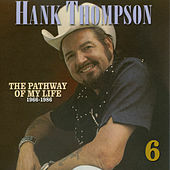 Born in Waco, Tex., in 1925, country star Hank Thompson's success and career longevity is frankly amazing, given the fickle nature of popular music. From the late 1940s through the 1970s he was consistently in the country charts, landing nearly fifty songs in the Top-10 or Top-20. The key to Thompson's longevity lies in his songwriting and his band's consistent sound. 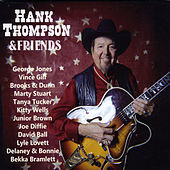 Thompson's songs often cast an unflinching eye on the drinking and carousing honky-tonk lifestyle, as exemplified by his signature song "The Wild Side of Life" as well as "Honky-Tonk Girl" and "Six-Pack to Go." Thompson and his band the Brazos Valley Boys created a prototypical honky-tonk/western swing hybrid sound, with twin fiddles, steel guitar, piano, bass and drums joining his rough-hewn baritone vocals to form a streamlined sonic juggernaut that was both hard-hitting and musically sophisticated. Thompson stuck by his sound over the years, and it has never really gone out of style. For much of his career he maintained a brutal touring schedule of over 200 nights a year on the road. Thompson released a record of brand new songs in 2000. Not bad for a 75-year-old man. He passed away in hospice on November 6, 2007 at the age of 82 after being diagnosed with lung cancer.